I have seen multiple photos of cave passage during the years, but until recently and I hadn’t had the good fortune to visit the Prohodna cave personally. Quite surprisingly on Sunday, we decided to go there to see this phenomenon. Where is the Prohodna cave? 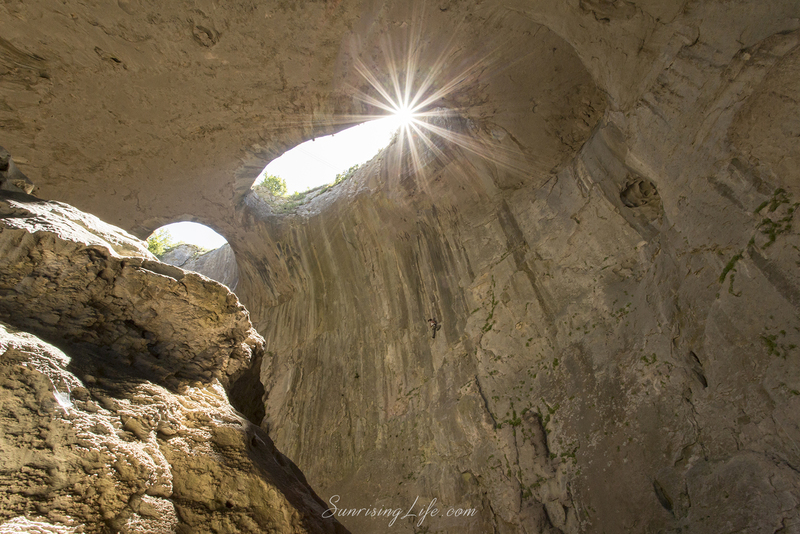 One of the largest karst regions in Bulgaria is Karlukovsiyat gorge. It is full of rock bridges, caves, ravines, some rock monastery. Karlukovsiyat gorge is situated in northern Bulgaria in Lukovit. There is the longest cave tunnel in the country – Prohodna cave length of 262 meters. It was declared a natural monument back in 1962. The cave is situated about 120 km from Sofia. Starting from the capital you should take the Hemus highway in the direction Lukovit, then to the village of Rumyantsevo. 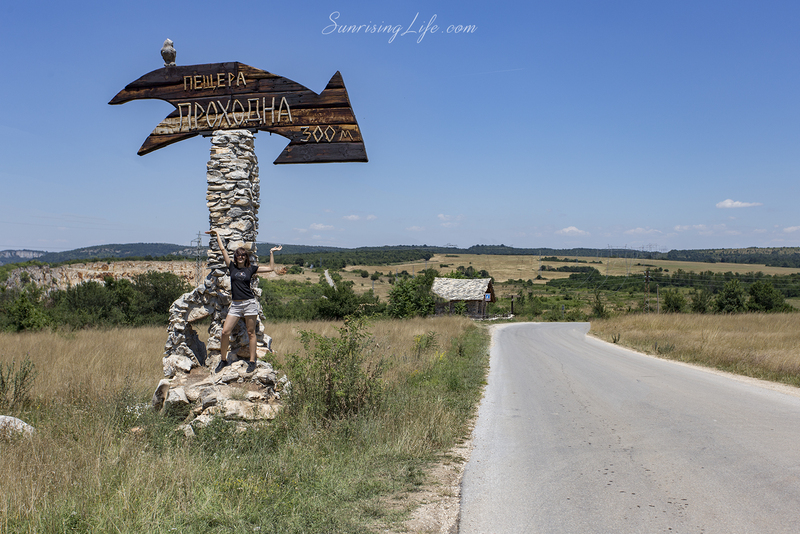 The village road deviates to Karlukovo. Shortly after Karlukovo, there is a sign that shows the direction to the cave passages. After about two kilometers there is a separate area where you can leave your car and you are going to get about 250-300 meters to the entrance. The name of the cave speaks about its type – cave passage. On the one side is her big entrance, which is high as 45 meters, and the other – the small one with height 35 meters. Entering the cave you will be fascinated by the scale of the space. Even pictures can not fully recreate the grandeur of this cave space. The passage is definitely not like other caves that we used to visit. It combines the coolness of the cave with the light of day.It is lit by two big holes in the ceiling that are formed naturally by erosion of karst arrays. These two huge holes made the cave unique. They are almond-with shapes and very much resemble eyes are fixed on the visitors. With these two holes, the cave is also known as the place where are “The eyes of God.” We stood just below them and stared upward. Phenomenal is how nature has shaped so perfect forms. The cave is used for images of several foreign film productions as well as a known Bulgarian movie “Time of Violence”. Also, the place is a paradise for people who practice rock climbing. 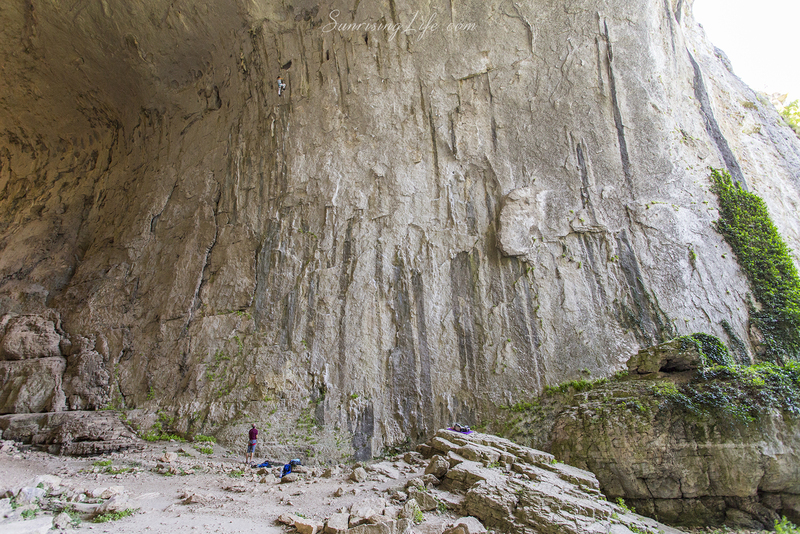 There are many climbers who have made rock routes of varying difficulty. At the end of the pass, or so-called “small entrance” make bungee jumping. This is one of the places that are recommended to people who will jump for the first time. 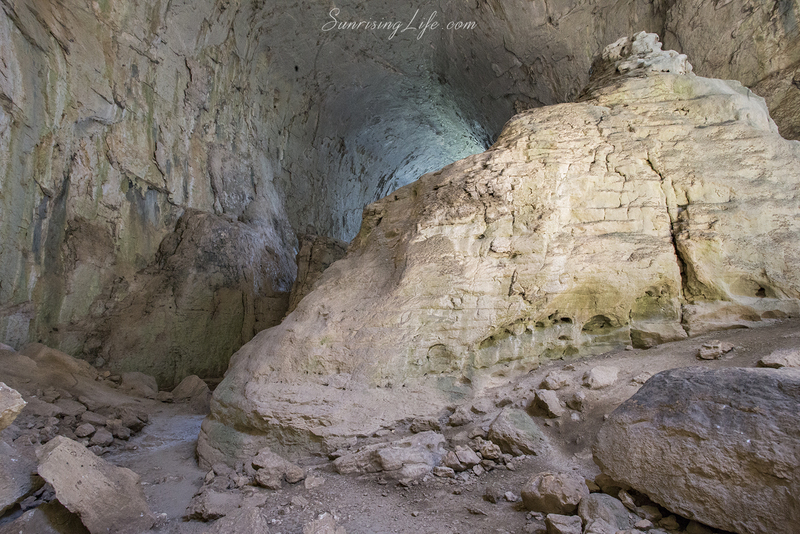 If you have a few free hours and are wondering where to go in the summer heat, we strongly recommend visiting the Prohodna cave and the surrounding area.